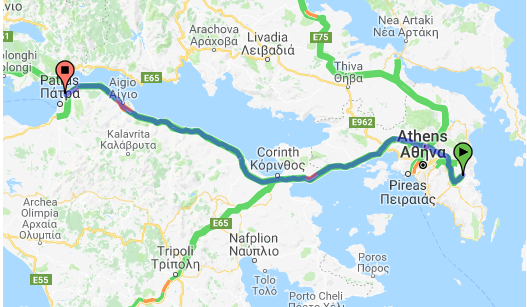 We would like to inform you that as the distance between the Athens International Airport and Patras is approximately 240km, our office will provide the option of organized group transfers from the Athens International Airport and vice versa. Moreover, we would like to mention that the travel time regarding the above distance is approximately 2h 30min. -The pick up location will be from the Athens International Airport (exact meeting point will be announced in the near future). -The drop off location will be each delegate’s hotel of accommodation in Patras. -The duration will be approximately 2h 30min. -The transportation will be offered with taxi or mini van. -The pick up location will be will be each delegate’s hotel of accommodation in Patras. -The drop off location will be the Athens International Airport (exact meeting point will be announced in the near future). • Participants who wish to be included in the group transfers, are kindly requested to choose one of the above valid transfer services, by completing the transfer form. Transfer requests must be submitted at info@conferre.gr the latest by March 30th, 2018. • The Organizing Administrative Bureau serves the right to combine transfers for congress participants with maximum waiting time 1 hour at the airport. This is valid only for the transfers from Athens Eleftherios Venizelos Airport to Patras. Participants who will choose one of the announced itineraries will be informed accordingly about the final time slot for their transfer to Patras. • The type of transportation (taxi or mini van) will depend on the final number of delegates who will use the transfer service. • Regarding the departures from Patras, participants are advised to choose the appropriate transfer (according to the above table), so as to ensure that they will reach the Athens Eleftherios Venizelos Airport in Athens at least 2 hours before their scheduled flight. • Please note that no transfer request will be valid unless accompanied by the duly completed form by each registered participant and followed by the confirmation of the Organizing Administrative Bureau. • By completing the form, all participants accept the terms announced on it. For the transfer form, please click here. In the framework of the LIVE 2018 there has been arranged a discounted Cost of 240 euros per transfer (Athens International Airport/Accommodation hotel – vice versa). Delegates are kindly requested to contact directly Mr. Harris Skarlas in order to make the necessary arrangements. The best and quickest way to travel from Athens to Patras is by bus. There are bus services from Athens to Patras, with departures approximately every half an hour. The bus terminal in Athens is called the "KTEL Kifissou”. If you wish to travel by bus to Patras from Athens International Airport, you have to take two separate buses. First, is the urban bus X93, which departs outside the Arrivals Area in the airport and gets to Kifissos Central Bus Station (in Athens). From the Kifissos Bus Station there is a suburban bus run by KTEL Achaia, that travels to Patras. Use the Suburban Railway System (Proastiakos) from AIA "Eleftherios Venizelos" to Kiato terminal station (route duration: 1.5hrs). At Kiato terminal station take the OSE bus to Patras or a taxi to reach Patras (route duration: 1.5 hrs). For further information you can visit the official website of the Hellenic Railways Organization. Patras' modern port (located very close to the centre) connects the city with Italy through over 50 scheduled ferry routes per week (departures: Venice, Ancona, Bari and Brindisi). Ionian islands are also connected to Patras by ferry boats available daily through numerous scheduled routes. The third major highway system in Greece is the Ionian Highway that connects Patras with the Northern Greece. Northern Greece is connected to the Peloponnese via the Rio–Antirrio bridge, 2,880-metre-long, one of the world's longest multi-span cable-stayed bridges.